Tips to Avoid and Correct Mistakes on a Motorcycle – Motorbike Fans recalls some of the most common mistakes that users make when riding a motorcycle. Learn to correct these vices that will help you to go more safely. The biker, whether a novice or with years of experience, wants to be effective and have the motorcycle always under control, something that can be achieved by following certain guidelines and knowing how to read the information that the motorcycle transmits to you at all times. Therefore, it is important to determine vices and bad habits on motorcycles that autodidacts have, without which they could evolve and reach another level of driving and piloting. To start, you have to concentrate on having a correct riding position on a motorcycle. Everything will be more logical and simple and you will eliminate vices and fatigue. A motorcycle is driven not only by the hands or feet, it is handled with all body parts, from the head to the feet. As insignificant as it seems, any detail that is uncoordinated will influence the bike, but if we do it well, we will be able to adapt to it and guide it to the place we want with less effort. Mistakes on a Motorcycle. The position of driving on a motorcycle has to have a specific relationship in order to have everything under control. The body must always adopt a relaxed position, with the extremities always flexed, the back straight and the knees stuck to the tank. The feet can adopt two points of support. Driving in a straight line, the feet should be supported under the central part of the plant, in the plantar arch. When turning at an angle of inclination, you must support the part of the pad under the metatarsals on the footboard to press harder and take refuge behind it to avoid rubbing or impact with the asphalt when tilting. This change of position only affects the foot that coincides with the direction of the turn, that is, if you turn to the right you change the position of the right foot and the same on the left side when you turn to that side. The arms have to be always flexed and with the elbows raised to be able to react to all the movements of the direction. The pelvis has to be as close as possible to the reservoir, as this will keep the back straight, the weight of the set centered and it will be easier to keep the arms and legs in the proper position of flexion and strength. The wrists have to be perfectly aligned with the inclination of the levers. In that way, they will not fatigue when they are constantly operated and more pressure can be applied with less effort on them. If they do not align well, you will have to change your position until you get it. In a sporty driving, the position is constantly changing. On the straights the body stays crouched, breaking up and forward to get brake and turn, acceleration delayed to get traction, and curves, with the inner foot resting on the pad of the metatarsals and the outer knee pressing to the deposit. 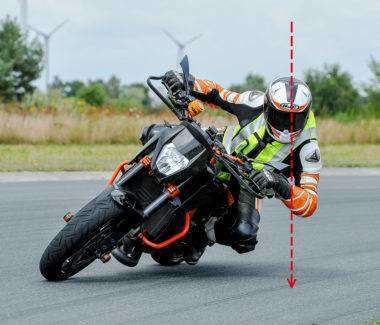 The mistakes on a motorcycle when braking, it is important to press the knee that is not free towards the reservoir, since it will help relieve the pressure of deceleration on shoulders, arms, trapezius, and cervical. The abdominal part of the body is important to keep it strong since it is the one that controls the total balance of the body. Different styles: Many times, on sports bikes, we can see that the rider takes off the rear end of the seat, tilts the body out of the body, and opens the leg towards the inside of the curve. Other times we see that the rider tilts the bike, but keeps the body centered in the seat, the elbows up and the foot ahead of the stirrup. In both cases, the bike will rotate correctly, but in the first, the bike will have less inclination than in the second and will be loaded less weight on it. What is the purpose of each riding style? At lower inclination, less risk of lack of adherence, but the body, being outside the body, in case of any incidence will have less control to rectify. In the second case, the tire will reach the limit of its surface, but in any case, the driver will have more control margin when carrying the elbows with greater height and flex. Choosing one type of position or another will depend a lot on the bike you are riding, the power of the bike, the type or condition of the tires, and the conditions of the floor. Clutch action: The clutch should only be used to start, change and reducing gears. There are people who operate the lever when it turns, something that is very dangerous and that many commit without knowing that they are incorrect and that they can be improved only by recognizing them. Brake only with the rear or front brake: Another frequent case is how to brake on a motorcycle. When we perform any type of pressure on the brake levers and levers, we influence the suspensions, geometry, and tires. Many of you do not know exactly how you do it, you just slow down; others use only the rear brake; others only the front and very few both at the same time. 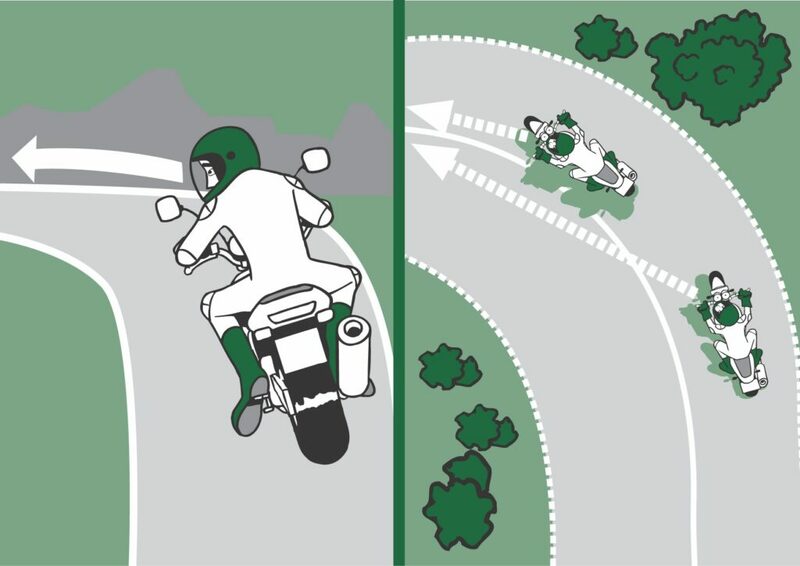 In each of the cases, the motorcycle reacts in a different way and therefore will maneuver in a different way. 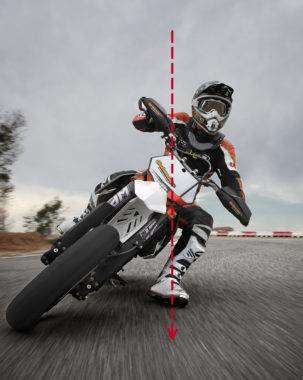 On motorcycles, braking must work in a similar way to cars (with more pressure on the front axle than on the rear axle), except that the distribution of pressure can vary according to our whim, that is, depending on the conditions we will operate or less pressure one handle or another. Asphalt bikes, the front disc brake, and calipers are larger in diameter and more powerful than the rear ones. On off-road bikes, the diameters are much more equal because the distribution of braking is more similar. Turning or stability? On a road bike the braking action must be simultaneous, that is, press the front and rear brake at the same time. The bikes are designed to distribute the braking pressure on each brake and this is the right one in 90% of situations. It has been decided in this way so that at the same time able to turn, stability and speed reduction are combined. If only the front is used, much more weight is loaded on the suspension and the tire, and the rear part is very freed. In this case, we gain a lot of ability to turn, but the bike becomes very unstable and before any surprise, it will be more difficult to keep the bike standing because of the risk of blockage (if you do not have ABS). If, on the other hand, you only use the rear end, the contraction of the rear suspension is caused, which causes the front end to lift. In this situation, the ability to turn is lost and the rear wheel lock is more likely. However, if you use both brakes at the same time, having more braking capacity in the front and less in the rear, the balance is adequate to maintain the ability to turn and stability at the same time. On off-road motorcycles, the use of the rear brake is greater, to block the rear wheel and turn in little space abruptly. Excess confidence: Many times we go on a motorcycle and, thanks to its dynamism and the adrenaline that it provokes, we can think that we are untouchable. Its agility and its small size makes it a perfect vehicle to avoid traffic jams and park next to your destination, but you must also bear in mind that the motorcyclist is one of the most vulnerable groups on the road, so there is always to take into account that, in case of fall, we have high chances of suffering injuries. Improper or inadequate equipment: At this point, we all know that the helmet is mandatory on a motorcycle. Now, we believe that we must influence the idea that the helmet will always be more effective when it covers, that is, the integral helmet is the best in case of accident, compared to other options such as jet, demi-jet or Modular But not only have to look at the helmet because the rest of the body is also important to protect it. For that reason, we recommend you to wear suitable clothes to go on a motorcycle (jacket and trousers), with gloves and boots (never flip flops!). And all this regardless of the type of motorcycle or scooter that you drive. In addition, you must be sure that the accessory you are wearing is your size and you are using it correctly. Otherwise, its protective capacity may be reduced. An example is the size of a helmet or not to use its closure. Look at the obstacles or dangers: Another common mistake that is difficult to avoid is when you unexpectedly find an accidental obstacle in the path. The higher the speed, the less reaction capacity you will have, so it is very important to practice avoiding the obstacle. How should we do it? In driving it is very important to always look in advance. This custom will help anticipate and anticipate unexpected surprises. In the case of surprise the effect of panic emerges, and most likely you do not stop looking at the obstacle and forget that you are going where you look. At that moment what you have to have is cold blood and keep looking towards the new trajectory to avoid it, that is, the gap or direction that allows you to pass it. To think that I am always right: Applicable in all areas of life, also on the bike. We believe that by riding a motorcycle we have the license to perform certain maneuvers that are not regulations or simply that the rest of the world has to see us. One of the advantages of motorcycles is their size, but it is also an obstacle to be seen by other drivers. Therefore, let yourself be seen, facilitate the maneuvers of others and, if you ever make an error, nothing happens to recognize the error and apologize to other users. Mistakes on a motorcycle.